I am working on a project right now that scares me. Don’t get me wrong. It’s not a bad project. On the contrary, it’s (potentially) big and exciting. It has generous upside. But it has downside too. In addition, it has lots of moving parts. It is going to make me do things that are new to me. It’s going to stretch the team…and me. It scares me because it’s (just a bit) outside of the norm for us. But here’s the thing…outside of the norm is where growth comes from. If you want to grow yourself, your sales or your business, this is the dilemma. You can’t grow (much) by doing the same things you have done in the past. Oh, sure, you can get just a little bit better at the things you already do. But you will never take the big leap that you want to by doing running the same plays from the same playbook. 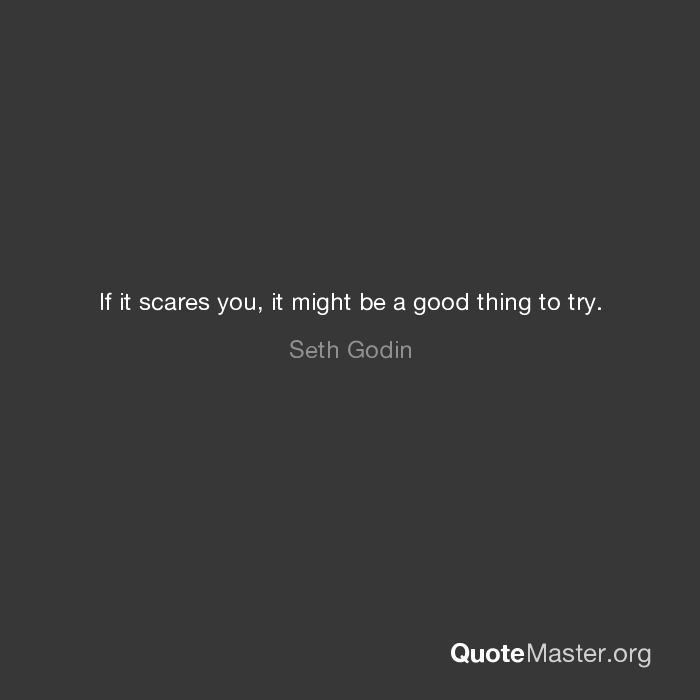 At some point, you need to try something new. You have to try something bigger. And that’s when the voice kicks in. The voice kicks in because you are uncomfortable and a little scared. The voice starts telling you all of the things that could go wrong. It fills your brain with worst case scenarios of doom. That voice is fear masquerading as your friend, pretending to keep you safe. When we hear that voice, we are often convinced to stay where we are. The voice shows up precisely when you are doing something cool and new and different. We most often see the voice or the struggle as a sign we are on the wrong path. We have wrong. The voice shows up when you are onto something! The thing that has been stopping us is often actually a hint that we are on the right track. It’s just how we interpret the signals. As I write this, I am up early on a project that scares me…and I am excited about it. Make sure you never miss a piece of content, if you head here you find all of our content in one place. And we also create one email called our VIP list where we deliver the content right to you once a week. You can sign up for that here. It’s time for the 7th episode of the He Said/She Said Podcast with Hasseman Marketing! This podcast is designed to give an inside look at projects we are working on and the challenges we are facing! So listen in and let us know what you think! Last week we talked about unplugging from technology. This week we check back to see how that is going. In addition, we talk about the need for taking time of meditation and prayer. Kirby and Amy each talk about their rituals and their struggles with that. This week, Kirby talks about the excitement and challenge of bringing on a new employee. This week, Justin Mullens started with us. You can read about that here. Kirby talks about wanting to do a great job on-boarding new employees…but never being sure if he is getting it right! We started this new session last week with the idea that we are trying to bring value. This time we chat about the notion that “once you find something you love, you will never work another day in your life.” It’s just not true…and it’s dangerous to say it. When you are trying to do something cool, or new there are going to be challenges and tough times. That’s not only ok…it’s a good thing. Listen in to here more on this one. Each week we want to give a shout out to an organization or an individual doing good work. This time on the podcast, Amy calls out Libbie and Em in the Hasseman Marketing office. You can find a bit more about them here. They do a great job of keeping the trains running on time at the HMC office! Kirby gives a shout out to his daughter Skylar. Not only is she chasing her dream…but she has done a great job here too! (Coshocton, OH)—Coshocton based marketing firm and promotional products distributor Hasseman Marketing & Communications is growing again. Hasseman Marketing is excited to welcome Justin Mullens to their team. 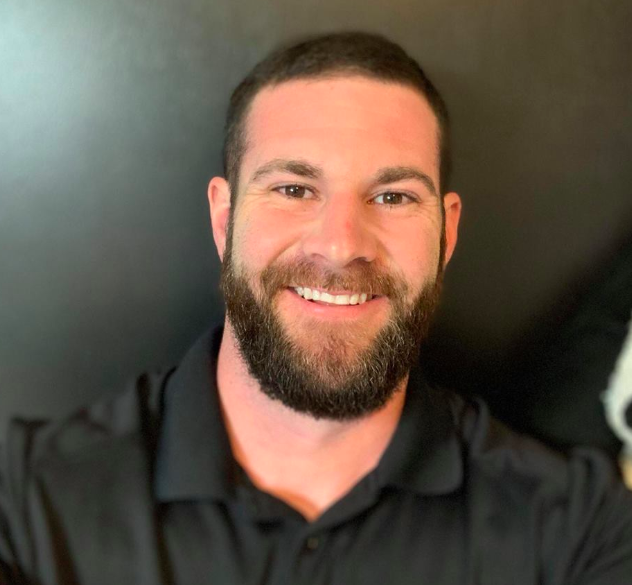 Mullens joins Hasseman Marketing after working for the last ten years at Spectrum Cable and will take over a new position called Digital Brand Manager. “We are so excited to welcome Justin to the team,” says owner Kirby Hasseman. “He has a great personality and I am excited to have him start working with our clients to help them grow their brand. The Digital Brand manager is a new position for Hasseman Marketing. In his duties here, Mullens will work with clients that utilize marketing services and social media management from Hasseman Marketing. He will manage social media accounts, create video content and work to “story tell” online. Justin has been a resident of Coshocton County his entire life. Justin Mullens has completed his third studying Digital Marketing and is starting his senior year at Full Sail University. Fueled by his outstanding work ethic and desire to learn more, he enrolled into an accelerated bachelor’s degree program. Throughout his high school learning, Justin worked at the local bowling center developing the communication and personable skills required to work with the public. From there, he became a technician with Spectrum Cable and has obtained superior communications, leadership and problem-solving skills in high pressure situations. Hasseman Marketing headquarters is located at 432 Main Street in Coshocton, Ohio. They can be found online at www.HassemanMarketing.com. In addition, you can follow them on Facebook at https://www.facebook.com/hassemanmarketing. For more updates from Hasseman Marketing, sign up for their VIP newsletter. You can sign up here. I believe this in my bones. We even talk about this here…and some ways to succeed in this space. But how can we talk about Succeeding in the Gift First Economy without talking about creating “marketing joy” with Promotional Products? You can’t. So let’s dig into how to “give first” with Promo. Created in back in the late 1800’s, Promotional Products are often an overlooked part of the marketing tool box. There are even some college professors that refuse to talk about Promo when it comes to marketing classes. This is short sighted, small-minded and frankly irresponsible. Why? Because Promotional Products Work…and it’s not just my opinion. Study after study is proving it to be true. So much so, that I wrote an entire book (Delivering Marketing Joy) on the subject. I don’t want to “re-litigate” the entire argument here. But I will include this one sections from the book here. *Of 1000 people surveyed that had received a promotional product, 89% could recall the advertiser. Say that out loud people. The name of the game in advertising is to create customer recall. Nearly 90% is a number that you might want to know when you are figuring your budget. *14.7% of participants reported contacting the advertiser after receiving the promotional product. That is nearly 3 times greater than other media. When done right, promotional products are incredibly effective. The more the facts stack up, it’s just hard to argue. The great irony is the other side of the coin is it can be argued these products work too well. Don’t believe me? Well look no further than the laws written to limit the amount of promotional materials that can be given in the healthcare industry to Doctors. These laws were put in place because Big Pharmaceutical companies were creating “undue influence” over these Physicians. Now some will argue that these laws were put in place because of free trips, game tickets, and extravagant dinners. But then why legislate the kinds of products that can be given to doctors’ offices? To put it simply, these laws were created because promotional products were having a huge influence on healthcare decisions. The goal of any marketing campaign is to affect behavior change. When you can implement a campaign so effective that it needs to be legislated…you may want to consider that strategy to promote your organization! Promotional products have been around since the late 1800’s and I think sometimes this is part of the reason the results are discounted. Everyone wants to know the newest, hottest ways to reach customers. You should! But don’t sleep on the power of promotional products. Now more than ever, you need to include them in your marketing mix. If Promotional Products work so well…how can you use them to help you grow in the Give First Economy? Let’s dig into that. As we like to say in the promotional world, when you create a Promotional campaign that works, your customers and prospects will thank you for your advertising! No disrespect to radio, or TV, or newspaper, or social media…but no one thanks you for advertising there! So how do you create a Promo Campaign that works and resonates in the Give First Economy? Here are just four things to consider to make sure you hit the mark. Probably the biggest mistake I see businesses of all shapes and sizes making is considering your promo ONLY on price. Of course, your budget has to be a part of the discussion! It should be. But just like in EVERY other area of your life, price should not be the only piece of information you consider. If you are shopping for a car, most people do not just look at price. You consider the features you are interested in. You think about the reputation of the dealership. You consider whether you want to drive lots of miles (so gas mileage might factor in) or if you will be going off road or driving in the snow. If you only consider price, you will likely get a vehicle you are unhappy with. You want a vehicle that is a good value. It should meet your needs AND fit in your budget. When you are considering a promotional piece, think about that item being a very real and tangible representative of your brand…because it is. Now that you have decided to create a promotional piece that is not just a cheap piece of junk (we all thank you), you should consider how and where the item will be used. Do you want your prospects or customers to have your branding around their office? Is that where these decisions are made? What about the kitchen? You would be surprised how many decisions are made there. Regardless, you need to consider your customer and where you can bring them value. When you spend just a little time to do that, you can come up with a promotional piece that is used, appreciated and valued for years to come! Next, consider what you are trying to accomplish with the promotional piece. Sometimes, you want to provide your customers and prospects information where they can reach you. Maybe (and I am just spit-balling here) you are a pizza place and you create a dry erase board for your best clients. You want them to place this on the fridge and have your phone number, website, etc. in front of them all the time. Great. This is more of an advertising or direct marketing approach. But sometimes you just want to create more brand affinity…and there is a ton of power in that. You might want to create a super soft, comfy and cool t-shirt. This warm piece reminds your customers of their feelings for your brand every time they put it on. You aren’t going to plaster your phone number all over the t-shirt (seriously, please don’t). With a piece like this, you create more brand recognition. Done right, they will remember you. By the way, neither of these is wrong. But it’s important to understand what you are trying to accomplish when you begin. Baldwin stands at the chalkboard and yells at his underperforming sales team and shows them the ABC’s of Selling. Promotional Products can be the perfect way to go to a client with a marketing gift just to say “thank you.” Going to your client, on a regular basis, with a simple “thank you” and a small token of your appreciation for their support, will go a long way toward creating a long and profitable relationship. Simply put, giving first is all about creating value for your customers and prospects. The best promotional campaigns are designed to do just that. As always, we want to help you. If you want to join our VIP newsletter so you can have access to all of the content on a weekly basis, you can sign up here. Oh…and it might make sense to bookmark our blog page where all of our content comes out!